Sense is intelligently designed to ensure simplicity of use. It has a clean and modern aesthetic, which makes it an elegant yet functional addition to the workplace. With its highly innovative design, the Sense desk can be built in a matter of seconds. Using Herman Miller’s plug + play technology the Sense legs simply screw into the frame without the need for additional tools or fixings. It is a simple and elegant desking solution which fits seamlessly into the modern office landscape, be that at work or at home. 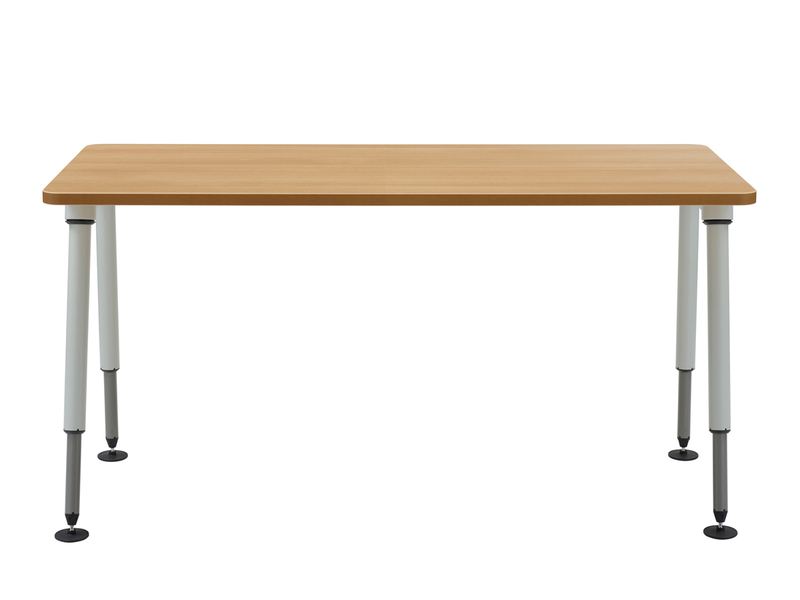 The Napoli oak melamine desk top is teamed with a steel under structure and legs in a chalk white finish. The legs are height adjustable at 2cm increments (between 61cm and 85cm) making Sense is a flexible option for furnishing your work or home office. “The age of Leonardo da Vinci is gone”, notes designer Daniel Korb, “but still I believe a holistic view to the world is needed”. Baden, Switzerland, is the vantage point for Korb’s perspective. It’s where he was born and the place where he and his wife Susan operate Korb + Korb, which they founded in 1989. Like many leading designers of modern office furniture, Korb started as an architect. Since then, his design expertise has broadened and his inspiration refined. Today, his creativity finds expression in architecture, communication and design. The intersection of these disciplines results in innovative ideas and, ultimately, smarter end products. Herman Miller veneers meet strict testing standards for resistance to wear, light, stains, water, and pressure. To reduce the risk of damage, take some precautions: Use coasters for glasses and mugs. If a glass top is added to the veneer surface, be sure it rests on felt pads. Don’t place a potted plant on a veneer surface unless it’s in a water-tight container or in a drip tray. Don’t let vinyl binders stay on a surface for very long. Use protective pads under equipment with “rubber” cushioning feet. Some chemical compounds used in the feet on office equipment, such as printers and monitor stands, may leave permanent stains or marks.